On December 4th, in just under two months, Mutant Year Zero: Road to Eden will make its debut on PC, Xbox One, and PlayStation 4. The game combines XCOM-like tactical combat with real-time exploration, stealth, and story as it puts players on a journey across a post-human Sweden where anthropomorphic animals scramble to survive in the remains of human civilization. Throughout the game, players can seamlessly jump between real-time exploration and tactical combat. 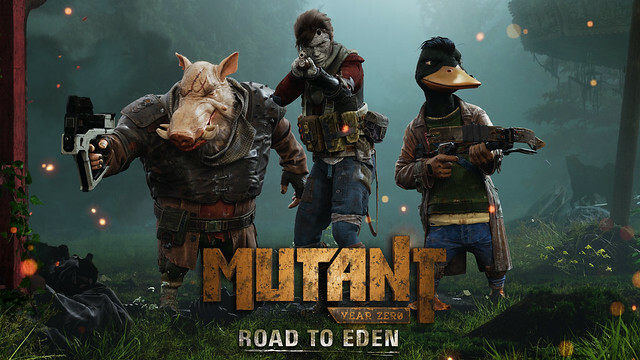 Since the game’s announcement in February (where the characters Dux and Bormin undoubtedly stole the show), Mutant Year Zero: Road to Eden have been collecting both awards and praise from press who have gotten hands-on time with the game. But, if you’ve been living under a rock for the past few months, the developers at The Bearded Ladies’ studio in Sweden are ready to show you what the game is all about. In the brand-new video released today, the team takes you behind the scenes at their Malmö studio as they give you the overview of what the game is all about and what players can look forward to. You can also find a written overview posted on mutantyearzero.com. Now available for PC pre-order on buy.mutantyearzero.com, the game will be available in a Standard Edition ($34.99) and a Deluxe Edition ($54.99). The Deluxe Edition includes a desktop wallpaper, digital artbook, digital soundtrack, and a digital copy of the Mutant Year Zero pen-and-paper RPG book. Pre-ordering the Standard Edition will give you a three-day head start at launch while pre-ordering the Deluxe Edition gives you the same head start as well as access to a Beta version of the game before launch. The game will also launch on PlayStation 4 and Xbox One on December 4th, simultaneously with PC. Mutant Year Zero: Road to Eden is developed by The Bearded Ladies and published by Funcom. For more information, please visit the official website at mutantyearzero.com. This looks more interesting now that I know what the hell the game actually is. The original release trailer did absolutely nothing for me. But now I am interested in finding out more between now and the time it takes for the game to be released. I can't pin it down. Is it mostly like Xcom but with more roaming and less base management?